Your thoughts and input on a 16 foot skiff for a noob. I found this site about i week ago. Lots of eye candy to see but much of it over my head and price point. I have been looking for a small aluminum boat. There have been a few that have caught my eye. One of them is from a company in Washington State. It is a 16 foot skiff that has high sides. My primary use will be for the San Francisco Bay and possibly the Delta. Is this a durable, good all around design? Does a boat like this have a decent resale value if I decide to trade up in the future? I already have a 25 hp Mercury that I would like to use. Please give me any input, good or bad that you wish to share. Re: Your thoughts and input on a 16 foot skiff for a noob. You happen to live on the right side of the country (the left) for thicker aluminum boat builders. I like the lee shore. Here are some others I'd like to see in person. There was an 18' sc with 50 hp Honda on Seattle craigslist last week. Think it was the owners boat this last summer. The crozier and silver streak being the most interesting to me. Looking at pictures of the lee shore, I'd want to drive one before buying to determine if I could see over the bow. Maybe Kevin Morin will chime in. He has insightful posts. crazy wrote: I found this site about i week ago. Lots of eye candy to see but much of it over my head and price point. I have been looking for a small aluminum boat. There have been a few that have caught my eye. One of them is from a company in Washington State. It is a 16 foot skiff that has high sides. My primary use will be for the San Francisco Bay and possibly the Delta. Is this a durable, good all around design? Does a boat like this have a decent resale value if I decide to trade up in the future? I already have a 25 hp Mercury that I would like to use. Please give me any input, good or bad that you wish to share. LeeShore builds a really nice boat, you have good taste in skiffs. The other boats in Rocky's post are also really nice. Any of these will do what you want to do and 20 years from now will be worth more than you pay for them today. A side note, the Canadian dollar is so weak right now anything built up there comes with a 30% discount. 30% discount! You sir are my new best friend. I like this one. That boat bought today is 4941.00 USD ($7157.00 CDN) and considering the collapse in commodity prices globally (aluminum included) alloy boats everywhere should be quite a bit cheaper than they are so don't forget to negotiate pricing if you are buying a new boat. Chaps wrote: That boat bought today is 4941.00 USD ($7157.00 CDN) and considering the collapse in commodity prices globally (aluminum included) alloy boats everywhere should be quite a bit cheaper than they are so don't forget to negotiate pricing if you are buying a new boat. I have a buddy in the metal business and we were talking about this recently. I don't think the price swings in the finished products are as dramatic. It may lower the price of raw materials a bit but my guess is the manufacturer would pocket that savings. Even still, how can you beat $4941 for a brand new shiny boat. Has anyone purchased a boat from Canada lately? I was looking into this recently and the place I contacted said I would have to pay a 1500 (500 paperwork, 1000 freight brokerage). Then I still had to transport the boat the rest of the way home once it was delivered across the border. Alternatively, I could pick the boat up myself and pay a 13 % Ontario tax that is no longer refundable even though you are taking it out of the country, and I would still have to pay 6% mi tax when registering it. On a smaller boat, these fees eat up much of the dollar's advantage. I haven't investigated extensively, so there may be a better way. If purchasing from Canada, you will want to see if there's a cost effective way to import a small boat. I don't think I would buy the motor from Canada though. It needs some extra paperwork for EPA and such. I was figuring it was extra headache I didn't want and I'd rather get the motor local from the same place I'd take it for service. When I looked on the interweb, I saw a 1% duty on a boat with an outboard. The guy from Canada said no duty. State tax is state tax. In California it must be paid on everything that you buy and register. In state, out of state or imported, so I don't think that should be factored into a comparison. As far as the other fees, I don't know but the guy I talked to made it seem like a pretty simple process. As far as the engine, I already have it and wouldn't bother because of EPA regs. More research is required but it is an avenue I am considering. Can we say, ROADTRIP!!!" I was looking at the wolfboats.com website and saw this boat called a MinKat. What do you guys think of this one? Is this a boat only for calmer waters? I have a 17' flat bottom boat, that has seen 3' +, have to pull the throttle back. I imagine a cat would take it better. I own a 16 ft Leeshore skiff that I use primarily for recreational crab fishing on Puget Sound. It is a strongly build, seaworthy inshore boat. The open configuration and high sides make it a functional and safe working platform. We typically are a crew of three and fish with 2 crab pots each. 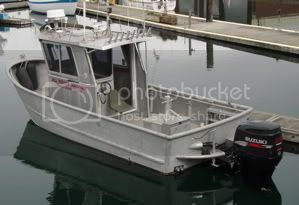 I am running a 30 hp Evinrude etec motor which is perfectly adequate and will plane and cruise at 20 knots with our usual crew and gear, however i plan to upgrade to a 50 hp Honda for 2019 for the occasions when we have a fourth crew member, are traveling further from our home harbor or when we get caught out in especially rough conditions. The skiff, despite its heavy construction only weighs 550 lbs, so it isn't a comfortable offshore boat in rough conditions. Or in other words, although it will get you home, it will pound in rough, choppy conditions. It is typical of the boats used by local tribal commercial fishermen in my area which is a seal-of-approval in my opinion, although they do mostly use larger boats, 18 feet and upwards. The summer just past was our fifth season with this boat and I have seen nothing on our local waters that would serve our needs better. Although it is the skills and judgement of the sailor the matter most, I personally think that it's a good idea to have a boat that you can count on to get you home safe. hit us up. I'm sure we can compete with all the legendary names. We may be new and not well know but that doesnt mean our designs and craftsmanship can be beat.